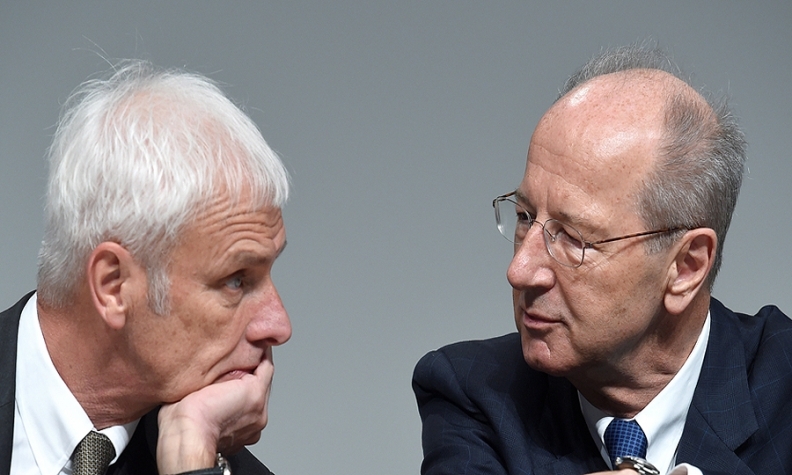 Mueller, left, and Poetsch, at VW's annual shareholder meeting this year in Hanover, Germany. HAMBURG, Germany -- Volkswagen Group has not ruled out breaking with company tradition and appointing an outsider as its next chief executive, Chairman Hans Dieter Poetsch said. Current CEO Matthias Mueller, whose contract runs through 2020, has been with the VW Group for nearly 40 years, including in senior roles at premium divisions Audi and Porsche. Several investors criticized his appointment, which came at the height of the carmaker's diesel emissions scandal in September 2015, saying it should have hired a new leader from outside the business. In comments emailed to Reuters on Friday, Poetsch said the supervisory board would deal with a successor to Mueller "in due course." "Of course we are open as far as the outcome is concerned," he said, in reference to whether a successor could come from outside the company or be a woman. The car industry is going through a period of change, with pressure to reduce pollution and embrace cleaner technologies, as well as autonomous driving, car-sharing and new competitors such as Tesla and Uber. The politician expected to win next month's election in Lower Saxony - VW's home state and second-biggest shareholder - earlier this month suggested that someone from outside the auto industry should succeed Mueller. Poetsch reaffirmed his support for 64-year-old Mueller, who raised some eyebrows within VW earlier this month with comments about possible asset sales. In an interview with the Wall Street Journal published on Sept. 7, Mueller said a new team at VW was working to sell assets no longer considered essential and that such businesses could account for up to a fifth of group revenue. However, the most senior member of the carmaker's ruling Porsche and Piech clan, Wolfgang Porsche, has since spoken out against selling any of VW's assets, echoing the opposition expressed by VW's powerful labour unions. VW asked banks earlier this year to examine options for its motorcycle brand Ducati and transmissions maker Renk, including selling the two divisions, sources have said, as it looks to fund a major shift to electric cars and mobility services. "Matthias Mueller, and that's the view of the entire supervisory board, is the right man," Poetsch told Reuters.